Super Savings Item! Free Shipping Included! Save 36% on the Coca-Cola KWC-4 6-Can Personal Mini 12V DC Car and110V AC Cooler by Coca-Cola at Just Gathering. MPN: KWC-4. Hurry! Limited time offer. Offer valid only while supplies last. Koolatron coca cola fridge is collector's favorite. It is great for offices, dorms, kitchen, living room, anywhere as you may like to carry. Koolatron coca cola fridge is collector's favorite. It is great for offices, dorms, kitchen, living room, anywhere as you may like to carry. Koolatron coca cola fridge cools up to 32-degrees below ambient temperature. Koolatron coca cola fridge has 4-liter capacity, holds 6 (12-ounce) cans. 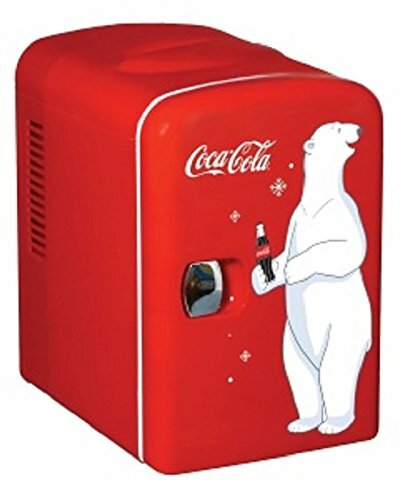 Self-locking recessed door handle.The Koolatron Coca Cola Personal Fridge 110V AC power with an AC adapter. If on use the noise gets louder, must check for any debris or plastic part on the fan blades which may be the cause of the sound. Item is less than below 50dBA.